Pieter van Bloemen also called Standaart (1657-1720) was born and trained in Antwerp by the battles' painter Simon Johannes van Douw (ca.1630-after 1677). He was a member of the Guild of St Luke in 1673. He then travelled in Italy where he become a painter of 'bambocciate', i.e. small works representing trivial or base subjects related to contemporary Italian life, named after the master of this genre, Pieter van Laer, nicknamed Bamboccio. He was himself nicknamed 'Standaart' because of a recurrent details in his battles' compositions by fellows Dutch and Flemish painters based in Rome in the society Schildersbent. This painting is a typical example of Pieter van Bloemen's production of Italianate landscapes. He had a large output and was particularly known to master the representation of grouped 'still-life' animals that he usually put in the foreground of his compositions and therefore appear as his main centre of interest. This great observation after nature is also witnessed in his many drawings that represent mainly landscapes and figure and animal studies from life. 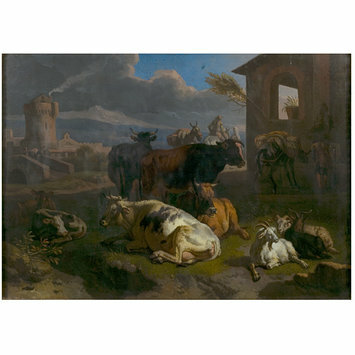 Cows and goats resting in the shade set in an Italianate landscape with architectural elements and figures with horses in the background. 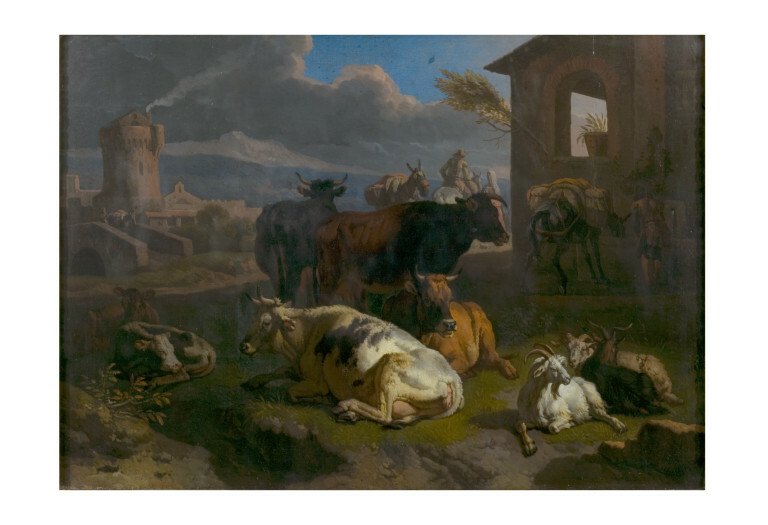 Historical significance: This painting is a good example of Pieter van Bloemen's output. He chiefly produced Italianate landscapes with animals and figures, set in a warm sunbathed countryside. This imagery is typical of his Roman period during which he painted many pictures of this kind. The attention is focused on the animals and only in a second time on the human figures set in the mid-distance. As in most of his landscapes, the setting is imaginary and recalls an idyllic Italian countryside, which atmosphere is conveyed by a warm and bright palette as well as by one or two Italian houses or monuments in the background. Characteristic of van Bloemen's style are carefully grouped animals, which arrangement he reused several times in slightly different compositions. 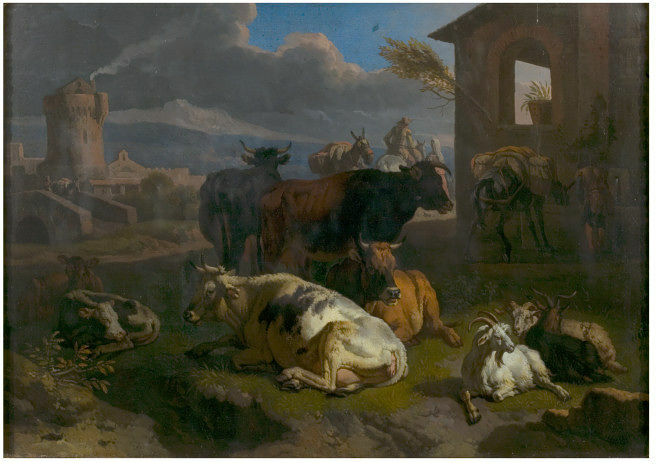 The group of cows and goats in the present painting is almost identically reproduced in another Italianate landscape housed in the Galleria Pallavicini, Rome. Italianate landscapes were particularly praised during the 17th century up to the early 19th century. The term conventionally refers to the school of Dutch and Flemish painters and draughtsmen who were active in Rome for more than a hundred years, starting from the early 17th century. These artists produced mainly pastoral subjects bathed in warm southern light, set in an Italian, or specifically Roman, landscape. They formed in Rome a proper association called the Schildersbent, which flourished from ca. 1620 to 1720 and was notorious for its opposition to the Roman Accademia di S Luca.The term is also often applied, but wrongly, to artists who never left the northern Netherlands but who worked primarily in an Italianate style. Eighteenth-century collectors, especially French ones, preferred a view by Nicolaes Berchem (ca.1620-1683) or Jan Both (ca.1610-1652) to a scene of the Dutch country side by Jacob van Ruisdael (ca.1628-1682) for instance. The taste for the Italianates continued undiminished into the 19th century. An early voice denouncing these artists was that of John Constable (1776-1837) and at the end of the century Italianates had lost favour oartly because of the rise of Impressionism and the appreciation of the Dutch national school of landscape expounded by such eminent critics as Wilhem von Bode, E.W. Moes and Cornelis Hofstede de Groot.